I’m sure you will think I am crazy when I make this offer, but I am happy to apply a ton of customization to your Zoho database for you for free… no charge to you… nada… zip… no strings attached. Really. You are currently in the Enterprise edition (even if you are in trial mode and plan to go to a different version at the end of the trial). 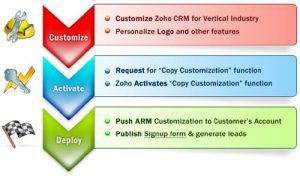 If you meet these two conditions, Zoho has a feature that allows me to copy some of my favorite customizations to another Zoho CRM account. It probably only takes me about 2 minutes to do it (if I am slow). Really, I’m talking hours worth of work that I am offering to give you for free. These are not really major changes to the database, but sometimes it is the little things that make all the difference in end-user adoption. 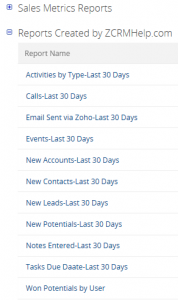 And having these reports at your fingertips helps you to quickly evaluate who is working in Zoho and who isn’t. OK, I have a database where I have created all of the ideal changes that I make to every client’s database. I feel like these changes to default displays and a few other types of changes make it easier for end-users to understand and use everything more quickly. If my client doesn’t meet the conditions that I outlined above, then I have to manually make these changes… and that’s all right, but I have to charge for that and I would much rather we spend time working on more exciting plans. I’ve been working with Zoho for a long time, so even if you don’t understand the exact features I am offering you below, I am asking you to trust me. These are really valuable changes to your database. Notice how the Email changes from the right column to the left. Other fields swap columns as well and the Lead Status field goes missing, along with the Website (which only converts to Account, but I like to see it on Contacts as well so I can research the person). My customizations fix all of this. 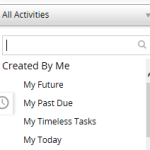 Adds 4 custom views for Activities (My Today, My Future, My Past Due, and My Timeless Tasks). The first two combine all activity types into one view… instead of having to search 3 separate views to see what you have on the schedule for today or the future. 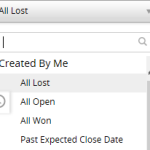 Adds 4 custom views for Potentials (All Open, All Won, All Lost, and Past Expected Close Date). You would think that those would be included in Zoho by default, but they aren’t. Modifies the Business Card layouts at the top of each view to be more helpful. For example, if you are looking up your own clients, why do you need to see your own name at the top of the page. Wasted! I want to see other helpful bits of info at the top. Customizes the Search layouts for each module. When you enter text in the Search box at the upper right, Zoho displays lists of every record type that could possibly be related. But the fields that display in the list make it hard to figure out which record you were searching for. So I add key fields to the default Search layouts for you (e.g. For Potentials, I add the Account Name, Contact Name and Account Owner. For Notes, I add the Created Date and the Note Owner. For Tasks, I add the Task Owner, Due Date, Contact Name, Related To and Status.) I make changes to almost all of the modules to help you find what you are looking for faster. Adds related Links in the side panel on Leads, Contacts, and Accounts to help you quickly search for information on the record (LinkedIn Search, Google the Person or the Company, and display Local Weather). With a single click on one of these links, it will open LinkedIn with the associated contact displayed, or display the local weather conditions for where your client lives. Adds a “Team” profile which can be assigned to your new and existing Users. It gives a bit more permissions to your users without giving Admin permissions. It is a much better Profile option than Standard for controlling the ability of your users to do things like import, export, delete, etc. Changes the “CEO” Role to “All Access”. This is only a name change. Many people mis-understand the CEO role and think it is only meant for the President of the company. It just means, whoever is assigned to a CEO role can see everything. So I rename it to All Access to make the meaning of this role more clear. Changes all Data Sharing Settings to “Pubic Read/Write/Delete” so that your users can actually share notes and see each other’s calendars if desired. “Private” is the default and does not work for most companies who are using their CRM to share data. Rearranges the modules in the menu line just a bit to group the features a bit better. For example, I move the Activities module closer to the front so it is easier to get to your Task List. 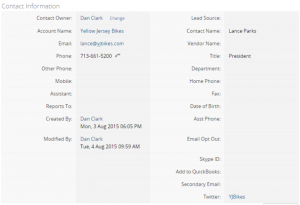 Adds only two fields: Website and Status on the Contact Record. I know it is really an Account thing, I just like these two fields on the Contact so that as I am doing research, it is easier. However, if you don’t like that addition, it is an easy field to delete. I want to reiterate, this process does NOT add any records to your database and you do NOT have to remain at the Enterprise level after the customizations have been applied. I can also send you instructions on how to change your password afterwards, so that I no longer have access to your database. I am very fast at making changes like this, yet it would take me more than 2 hours to do all of this manually in your account. And while I do think that these are really important changes to make, they are very repetitive in nature. I’ve spoken with Zoho about making these kinds of changes by default. But until then, this is an easy way to transfer the defaults and updates. And I’m happy to do that for you. I’m hoping that if you like what we’ve done, and if you are interested, you’ll call us when you are ready to do more customizations, figure out how to market with your database, setup Workflows, or integrate with other Zoho products. I love that I can spend time with my customers to help them be more productive with their database.